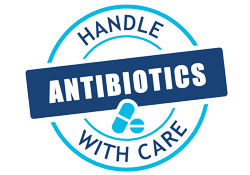 Antimicrobial resistance (AMR) is the resistance of a microorganism to an antimicrobial medicine to which it was previously sensitive. It develops when a microorganism mutates or acquires a resistance gene. Resistant organisms (including bacteria, viruses, fungi, protozoa and helminths) are able to withstand attack by antimicrobial medicines such as antibiotics, antivirals and antimalarials, so that standard treatments become ineffective and infections persist and may spread to other people. Antibiotic resistance is a growing threat to global health. Many of the same microbes affect both animals and humans via the environment they share. One sector alone will not solve the problem; a “One Health” approach is needed. A joint initiative to survey, contain and prevent the emergence and spread of antibiotic resistance in the European Region. Tweets about "#EAAD OR #AntibioticResistance"
The number of people out of 400 000 who die every year in the European Region due to an infection with a resistant bacterial strain.